I respect usage as common (flat) bicycle pedals as clipless pedals too. It is not matter of “holywar”. I’ve passed several 200 km brevets on flat pedals. There are some pluses and minuses in each kind of pedals. Looks like the main difficulty of “clipless” is finding cleat position on bicycle shoe. It firmly determines where foot is fastened to the pedal. In “common” pedals, you can put the foot as you like, but of course there is some habitual position. When I’ve switched to clipless pedals, set cleat position so that the location of foot was the same. It turned out that it does not work. translation: Good day. You write very useful and informative articles, thank You. 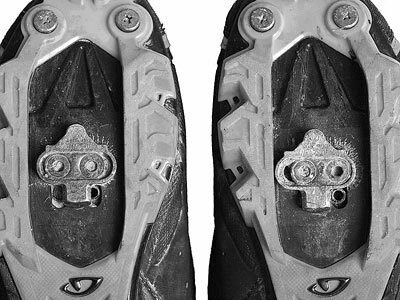 Would like to see details for right SPD cleat posiiton on cycling shoes. I’ve tried to find info but or it is not so clear or very controversal. On flat pedals I tried to follow the rule: ball of big toe joint on the pedal axle. It is generally considered as traditional. Approximately in such manner maximum load is applied when walking or running. Especially, in a shoe with a sole that can be bent. 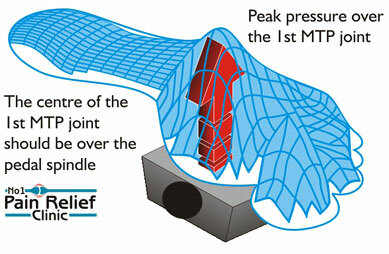 When bending of sole is maximum main load goes to ball of foot, from which the foot is pushed forward-upward. Pedalling is different from running. The main load is when foot push the pedal down-backward. In principle, the same force. However, pressure is applied not to the floor but to pedal which rotates around spindle. This leads to the fact that the bent in the shoe sole is not needed. Even more. As bent “serves” the load of the ball of foot, so the load on the ball is also not needed. Like in walking on sand. However, if to follow traditional guidelines that are at the first place in network , position of foot on pedal is determined by the maximum load of big toe ball over pedal axle. I underlaine once again that this look quite natural. You walk to the bike, then sit on the bike and just also “walk”, but on the pedals. You can try to put a foot such that push to pedal with another place of sole, but it is different from walking and is not convenient because the running shoe is designed for keep load on ball. If to press pedal by another place of sole it may even be painful. 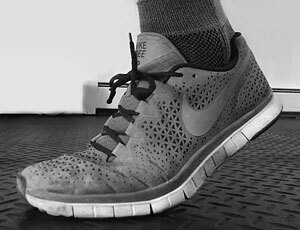 Bike shoes fundamentally differ from running shoes by rigid sole. Ideally, in bike shoes sole not bend at all. Can bend on some models for “touring”, but it is a search for compromise. 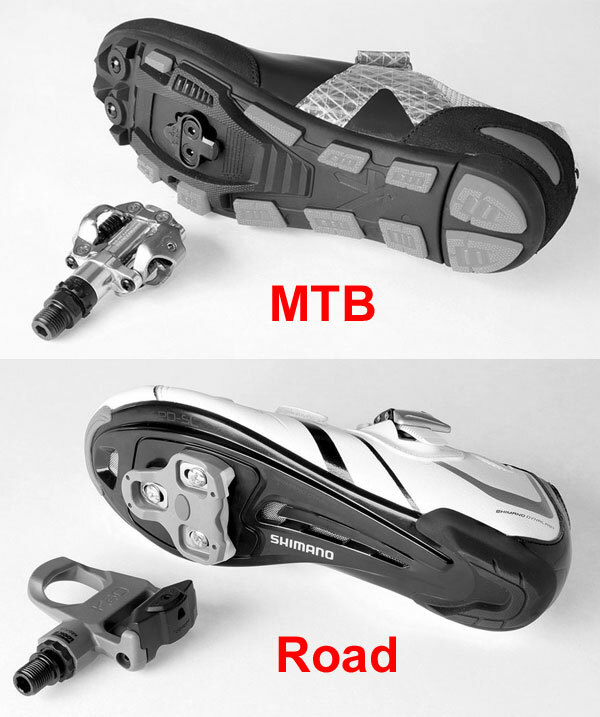 There are two classes of bike shoes and clipless pedals for MTB and road. “MTB” stuff can be used on road bikes while road shoes and pedals usually not used in MTB. The theme of “cleat position” for both kind is very similar. 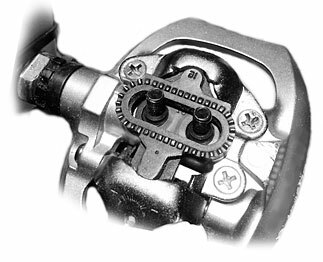 Below, I will consider setting MTB SPD type cleat positon, because it corresponds to my experience (“My pedals: flat and clipless“). I expected that “clipless” should provide additional advatages on long-rides. Thus all experience and habits of use flat pedals should be included. At first I put cleat position over the ball of foot. Mid of cleat corresponds exactly to the pedal axle. So it is easy to set ball of the foot over the pedal spindle with high accuracy. Frankly, doubts began immediately. 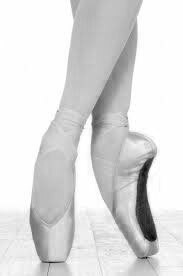 All people with the same shoe size should have similar position of of big toe ball. 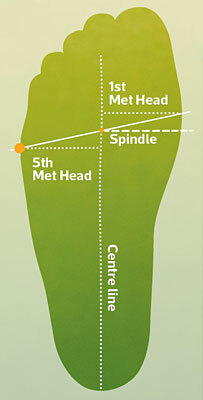 Foot of course may be different, but not so much as range of cleat position. Therefore, the first wish was to “forget about the ball”, and put the cleat position to the middle of the adjustment range. But two of us have got bike shoes from different manufacturers. And cleat position in the middle was quite different with respect to the ball of foot. 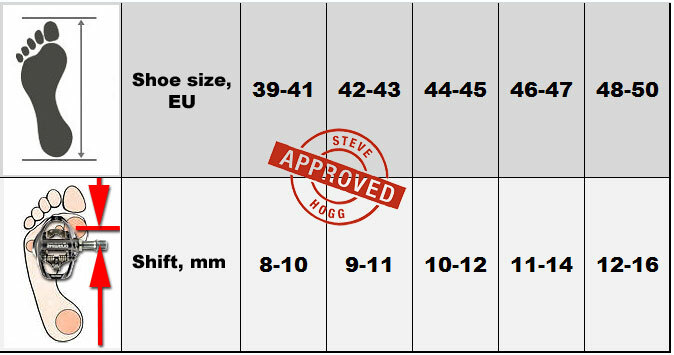 That is, the concept of “mid” cleat is different in dependance of manufacturers, so I afraid to use as default. First rides have shown that position of ball of big toe over pedal shaft was not good for us. And pedalling was not convenient, and power drops significantly. All this in comparison to pedalling on flat pedals. But this experience we were not going to throw away. It became clear that in flat pedals we set foot slightly forward of axis. There is nothing strange in this, because you put the foot on the pedal frame, and not feel the axis, so where is exact position is unknown. But if the ball-to-axle is not appropriate, then where it should be? Digging the Internet has led to primary source. Steve Hogg: Power to the pedal – cleat position (2011). Article is quite large. 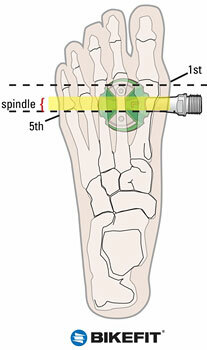 A significant part of the article is devoted to the explanation of why the pedal axle must be behind the ball of the big toe, ie be shifted to the heel. Then following simple guidelines that will bring here. Method №2. The axle of the pedal must be placed midway between the balls of the big and little toes. Typically this method should give the same values as the number 1, except may be a little difference for the left and right foot. And if not the same, then choose any. This method perhaps became more prevalent, the picture is not from article of Steve Hogg. Unfortunately, given also Method №3: put a cleat in the middle of the sole. 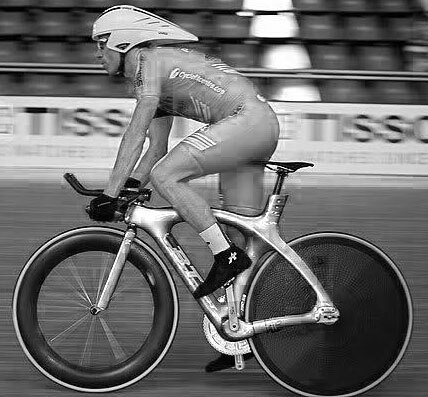 To do this, you need to alter the shoe, change the sitting, redevelope pedalling, but then… Here for example a photo. So, practical conclusion is not comprehensive. Of course the pedal axle must be placed behind the ball of foot, ie shifted to the heel. But for how much? Well, let’s method 1 and 2 give roughly the same value (as in my case), but you need try to shift even further (as method 3 invites). Certainly not to the center of the boot, so as not to delete the previous experience of pedaling, but still need to try. The another primary source, from 2012, Bike Fitting: road bikes. It gives about the similar recommendations, but I bring it here, because at example it suggested to put ball of the little toe to border of pedal spindle. That is, move the axle further to heel than on the methods 1 and 2 by Steve Hogg. Fortunately, here is quite bright criterion of how much cleat can be shifted back. 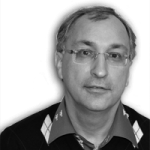 However, I do not know if it is correct, as it is my experience, I did not met in the web similar proofs. So, I put cleat position in the middle of the balls (Method №2), ride, like it. And then for experiment shifted it back to 5 millimeters. On the movement of foot forward-downward toes begin hardly push inside to shoe toe. Here is a picture that I showed in the note Pedalling in a circles: clipless vs flat pedals. In the picture I pointed with red circles “back and forth” pressure inside the shoe when foot moving horizontally. At the bottom the pressure applied to the heel. Heel is well-designed for this, and it is not the maximum force in a circle. At the top, on moving forward foot inside the shoe press forward, and with increasing force. Hereein the foot can support on the balls of toes also, because it not only pushes forward, but downward also. But pushing forward anyway. And how much of this pressure fall to toes depends on the position of the fulcrum. It is a fact that is felt well. I think we can explain it from the fact that the foot is based on the shaft around which is swung. On the right of above picture I have placed an illustration of such swinging. When heel swing down, there is a pressure to the heel. Heel, as mentioned, bear it good. And when the toe down, then there is pressure to toes, the more, the more the “shoulder” of the lever. For clarity I’ve transformed image from the network to illustrate forward bend around the axle of pedal. At the left pedal position axis on the ball, at the right – behind the ball. Red marked illustrate degree of press toes to the shoe while the pedal move forward and down. 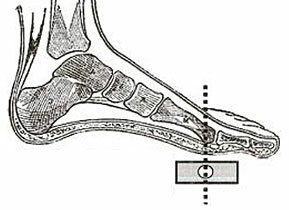 It is clear that more cleat position is shifted to heel – more pressure to toes inside shoe. So, there exist some limit of shift when such press goes out of habitual. Let me add that there should be no illusions that because of rigid sole of bike shoes, and fitted to foot perfectly, and even tightened to numbness, then the distribution of pressure goes evenly on the whole foot, not to the toes. 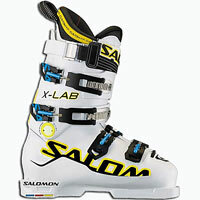 The ski boot, for example, fit the foot is much more accurate, and the “shell” is much harder, but in the sportive skiing load on different parts of the foot plays a big role. You must be possible to feel the load of “bog toe edge”, “little toe edge”, heel, toes balls, etc separately during the turn. Good news, such an unpleasant excessive load on the fingers in a phase of pedaling “horizontally, from the top to down” is felt immediately. No need to wait for the result of long ride, wait the numbness of the toes, etc. Thus about cleat position “back and forth (Fore/Aft)” everything is pretty simple. Put the cleat according to the method of 1-2 by Steve Hogg. Then, if there is an unpleasant pressure on the toes during force pedalling, shift cleat forward. And if there is no unpleasant pressure, then shift back until you find the border beyond which the unpleasant load appears. In my case, the position of cleats occures slightly different. This is not something strange, rather the way it should be, because the man is actually not very symmetrical. At bike it is not felt so much as in skiing, for example. More arguments in this article”Slalom, work on technique in the season 2016. Fight against asymmetry“. 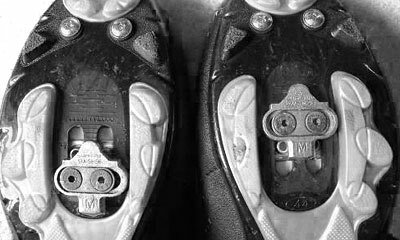 In the photo of my installation of cleats it can be seen that at the left shoe (right image), the cleat is shifted so that to bear leg outward. This adjustment is “right-left”. It is not as important as considered “forward-backward”. And the adjustment range is not very large. Right and left from center is only 3 mm. Had to do this adjustment because of the numbness of the left foot (if “loose control”) after riding of 100+ km without a break. Process began with the outer side of the foot. This numbness can be due to many different reasons, such as position in the saddle. Therefore, such a problem with numbness likely not related to the subject of the installation cleat, this is the area of “bike-fitting”. But in my case it was interesting that on the right foot everything was OK . Having tried a lot of interesting things, finally measure the difference from the cranks to the bicycle seat tube. It turned out that the right, where the “stars”, crank is farther to 5mm! 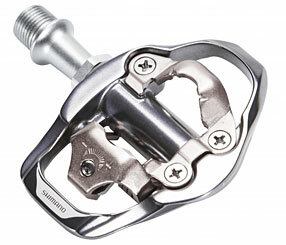 Therefore shifted cleat to left limit of bicycle shoe. So the foot be shifted out by 3 mm, reducing the difference with the right foot to just 2 mm. Oddly enough, it helped. Now for at least 200 km brevets, can “do not listen” the left foot. In principle, for such cases ther are extensions for axis of the pedals, but I mark again that this is a “bike-fitting”.